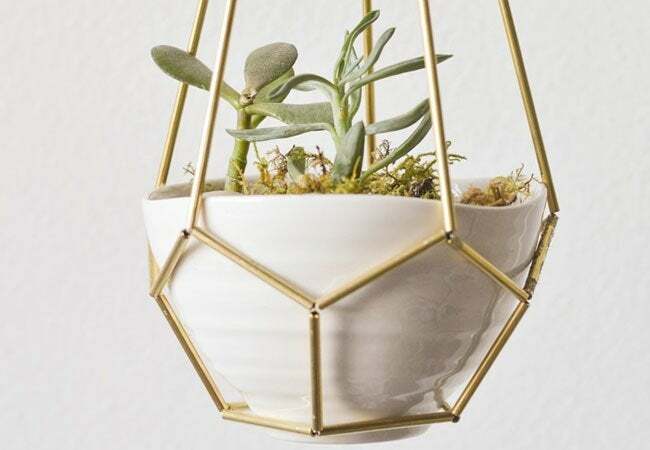 Perfect for indoor or outdoor use, these DIY hanging planters will help you hold on to your summer greenery and transition it smoothly into winter. ‘Tis the season for winterizing your garden, a task that gives you the opportunity to bring your most beloved plants indoors. What better way to display these seasonal visitors than on a perch in your direct line of vision? (And one that takes hardly any counter space, at that.) Get inspired by these five DIY hanging planters that make it a cinch to showcase your favorite greenery and protect it from the chilly weather ahead. Although glass terrariums are a sleek, functional way to showcase prized greenery, the price of a store-bought glass design can be steep. 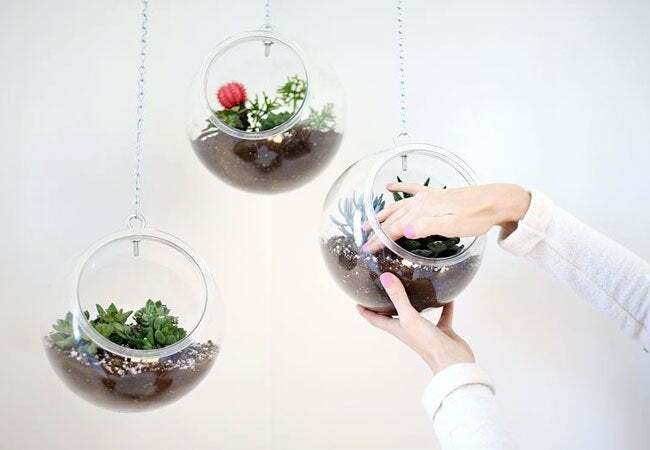 Take a cue from A Beautiful Mess and make your own budget-friendly version instead—from none other than a clear plastic fishbowl (or two or three, depending on how many plants you’d like to display). Turn each transparent bowl on its side for easy watering, but enjoy an unobstructed view of your buds from nearly any seat in your living space. Raise not one, not two, but four terra-cotta pots off the floor using this vertical planter from I Heart Naptime. The best part? Scrap wood and rope are all you’ll need to build it—and likely already on hand! Although the rustic display looks great with succulents, you could also build your own hanging herb garden with each seasoning—from basil to rosemary—displayed at a different height. This faceted teardrop planter from Vintage Revivals elevates your greenery, both in height and in elegance. And because it requires so little in the way of supplies, the finished project is a steal, costing only about $15 to assemble. You’ll need round brass tubing, floral wire, and a mini tubing cutter before you can get to work. Then, all that’s left to do is channel those geometry skills. 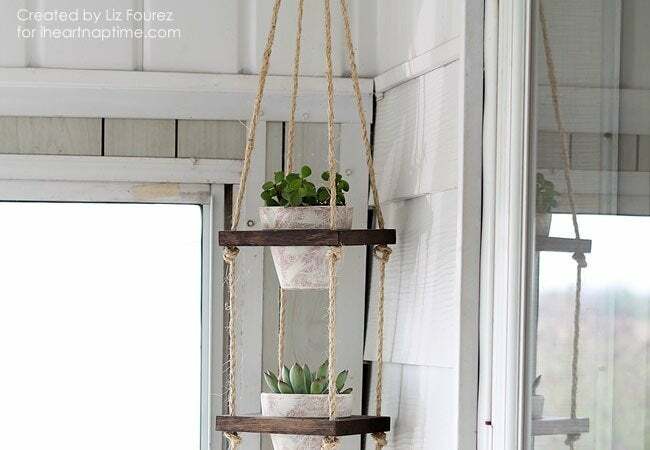 With a bit of patience, you’ll be able to string this DIY hanging planter together in a few hours. 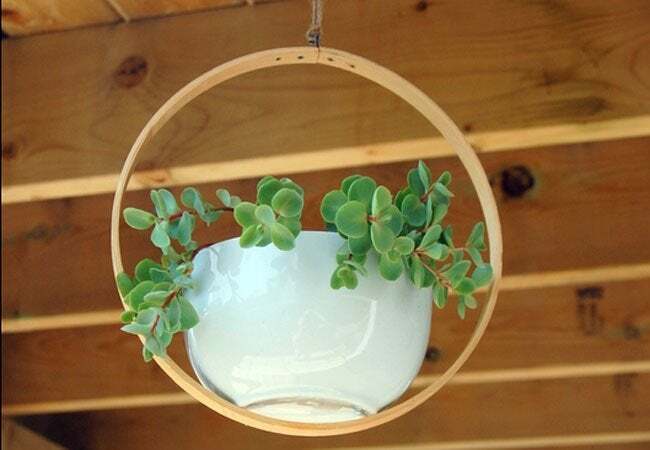 Instead of sending empty coffee creamer containers to the recycling bin, use them to fashion this hanging planter, as demonstrated by Hello Glow. Creamer containers are typically plastic, so use scissors (or an X-Acto knife) to carefully remove the tops and fill the majority of the containers with potting soil and greenery to turn the canisters into a tall planter. Holes poked in its sides for threaded twine make it ready to hang! A fresh coat of colorful paint is optional, but it really dresses up the planter. Do you have a few extra needlepoint supplies lying around? If so, follow this tutorial from Northstory for a different sort of craft: creating a lovely DIY hanging planter. All this one-of-a-kind design requires is an embroidery hoop and a ceramic bowl. 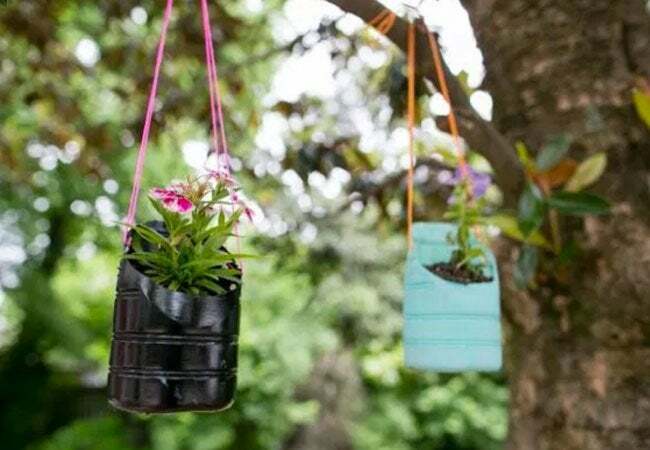 Glue the two materials together and let them bond overnight; the next day, you can hang your upcycled creation from a length of rope, and admire your gorgeous greenery as it sways in the breeze.